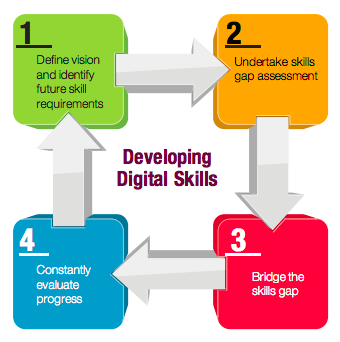 Article: Digitally yours: Can your organization meet the demand for digital talent? Digitally yours: Can your organization meet the demand for digital talent? Today, every aspect of our environment is digitally demanding. It is only natural that the need for talent that can effectively operate in this digitally charged world has been on the rise. Are organizations prepared to meet the demand? The hiatus between the demand and supply of digital talent has been widening. The rapid transformation of everything into digital often seems to have taken place too fast for organizations to keep up with the pace of change. In an environment as digitally charged as ours, companies need to ensure that their talent is digital-friendly not just to thrive but even to merely survive. A recent research in collaboration MIT observed that 77 per cent of companies feel that the dearth of the required skills poses a hindrance to digital transformation. As the complexity of our business ecosystem increases, the focus will shift further on capabilities like SMO (social media optimization), SEO (search engine optimization), AI (artificial intelligence), mobile-specific skills, cyber security and digitized branding and marketing based on advanced analytics. There appear to be two clear options when it comes to filling the digital talent cavity – buying new, “readymade” talent or upskilling the existing workforce in accordance with your organizational needs. While the former option allows you to pick and choose the exact skill-set, albeit often at a greater cost, the latter helps you energize your employees with evolved skills while still maintaining the holistic culture of the organization. 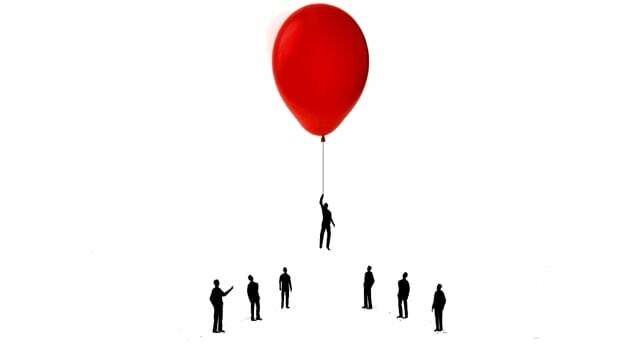 While there are companies who would prefer an injection of external talent to enable the transformation, there are also those who would rather evolve together. A balanced approach that allows the organization to tap into the best of both options is probably the most viable solution. It creates a more personalized and tailored talent ecosystem that is driven by the new addition of skills, backed by the organization’s tried and tested culture and rooted in the need to adapt, adopt and evolve. With organizations feeling the prssure to evolve, avenues like AI, L&D and HR tech have been evolving too along with all other processes but are organizations truly ready to take the leap yet? 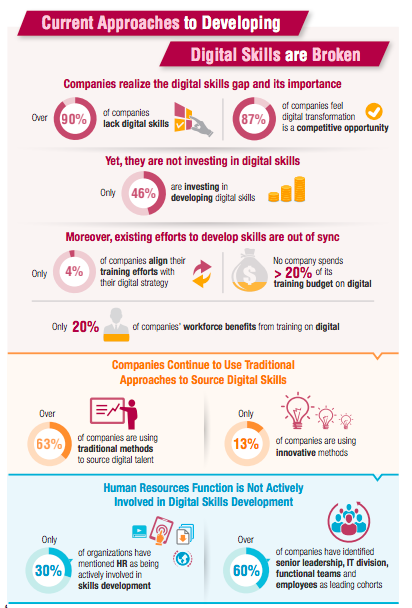 A research-based infographic by Capgemini paints an effective and clear picture of the contemporary state of digital talent. While the current approach to the much needed digital evolution is a little broken and disjointed, it does allow one to see where we are headed although the changes might take some time since “going digital” (as easy as the two words make it sound) presupposes a change of mindset and behaviour and that does not happen at the snap of fingers. An organization needs its The idea is also to be able to help employees transfer their developed digital skills that they use in their non-work lives to their work lives as well. When P&G collaborated with Google on an employee exchange programme, not only did it help them improve their digital skills and scale up Internet marketing plans, it showed the rest of the world the effectiveness of such talent exchange initiatives. Moreover, for a non-tech centric company to have its employees placed in a hi-tech centric company definitely opens up the road to digital and accelerates the learning process by enabling a hands-on change-friendly approach. Incubating and growing startups (or even just a “startup culture”) could also help inject your organization with the drive and digital flexibility of most startups today. That brings in a dynamic range of new ideas besides creating a more digital-savvy talent pool. However, charting out the path ahead (the how) is a process that can be engaged in only once the organization has identified the goal of the transformation (the where and the why) and has also ascertained the resources it has at hand (the what). Plugging the skill gap is only an aspect of the whole process of transformation. Any change loses its worth and power if it fails to be sustainable. That said, getting the first step of getting the skills right, will be of significant help in the exciting and necessary journey of digital transformation. To know more about the pace of digital evolution and ways to meet the demand of digital talent, join us for a tête-à-tête with HR leaders from across the globe at TechHR Singapore on 28th February, 2019 at Marina Bay Sands, Singapore. Register now!